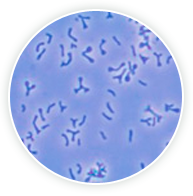 Learn more about the patented probiotic strain B. infantis 35624. Discover the potential health benefits of probiotics the proposed mechanisms of action, and the safety of probiotics. Review articles on probiotics, preclinical and clinical data on B. infantis 35624 and other scientific review articles on B. infantis 35624. And, if you're interested in obtaining even more information about probiotics, explore various other professional resources on the topic. What Is B. infantis 35624? What Is Bifantis (B. infantis 35624)? Bifantis is the trademarked name for the patented probiotic strain Bifidobacterium infantis 35624. For additional scientific information and data regarding Bifantis, click here. This photo shows the extra-cellular polysaccharide (EPS) coating of Bifidobacterium infantis 35624, a unique feature of some bifidobacteria. Joint FAO/WHO Expert Consultation on Evaluation of Health and Nutritional Properties of Probiotics in Food Including Powder Milk with Live Lactic Acid Bacteria. Cordoba, Argentina, 2001 Oct 1-4. Available at: www.who.int/foodsafety/publications/fs_management/en/probiotics.pdf. Joint FAO/WHO Working Group on Drafting Guidelines for the Evaluation of Probiotics in Food. London, Ontario, Canada. 2002 April 30-May 1. Available at: http://www.who.int/foodsafety/fs_management/en/probiotic_guidelines.pdf. Suau A, Bonnet R, Sutren M, Godon JJ, Gibson GR, Collins MD, Doré J. Direct analysis of genes encoding 16S rRNA from complex communities reveals many novel molecular species within the human gut. Appl Environ Microbiol. 1999 Nov;65(11):4799-807. Berg RD. The indigenous gastrointestinal microflora. Trends Microbiol. 1996 Nov;4(11):430-45. Leahy SC, Higgins DG, Fitzgerald GF, van Sinderen D. Getting better with bifidobacteria. J Appl Microbiol. 2005;98(6):1303-15. Picard C, Fioramonti J, Francois A, Robinson T, Neant F, Matuchansky C. Review article: bifidobacteria as probiotic agents—physiological effects and clinical benefits. Aliment Pharmacol Ther. 2005 Sep 15;22(6):495-512. Salminen S, Bouley C, Boutron-Ruault MC, Cummings JH, Franck A, Gibson GR, Isolauri E, Moreau MC, Roberfroid M, Rowland I. Functional food science and gastrointestinal physiology and function. Br J Nutr. 1998 Aug;80 Suppl 1:S147-71. Isolauri E, Salminen S, Ouwehand AC. Microbial-gut interactions in health and disease. Probiotics. Best Pract Res Clin Gastroenterol. 2004 Apr;18(2):299-313. Harmsen HJ, Wildeboer-Veloo AC, Raangs GC, Wagendorp AA, Klijn N, Bindels JG, Welling GW. Analysis of intestinal flora development in breast-fed and formula-fed infants by using molecular identification and detection methods. J Pediatr Gastroenterol Nutr. 2000 Jan;30(1):61-7. Favier CF, Vaughan EE, De Vos WM, Akkermans AD. Molecular monitoring of succession of bacterial communities in human neonates. Appl Environ Microbiol. 2002 Jan;68(1):219-26. Hopkins MJ, Sharp R, Macfarlane GT. Age and disease related changes in intestinal bacterial populations assessed by cell culture, 16S rRNA abundance, and community cellular fatty acid profiles. Gut. 2001 Feb;48(2):198-205. Satokari RM, Vaughan EE, Smidt H, Saarela M, Mättö J, de Vos WM. Molecular approaches for the detection and identification of bifidobacteria and lactobacilli in the human gastrointestinal tract. Syst Appl Microbiol. 2003 Nov;26(4):572-84. Balamurugan R, Janardhan HP, George S, Chittaranjan SP, Ramakrishna BS. Bacterial succession in the colon during childhood and adolescence: molecular studies in a southern Indian village. Am J Clin Nutr. 2008 Dec;88(6):1643-7. Fuller R. A review. Probiotics in man and animals. J Appl Bacteriol. 1989 May;66(5):365-78. Salminen S, Deighton M. Lactic acid bacteria in the gut in normal and disordered states. Dig Dis. 1992;10:227-238. Salminen S, Isolauri, Onnel T. Gut flora in normal and disordered states. Chemotherapy. 1995;41(Suppl 1):5-15.